The newest color combination is here! These orange reversed-backed cards are officially printed by the U.S. 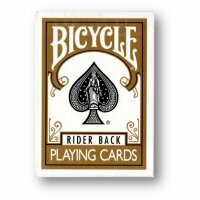 Playing Card Company with Magic Makers and can be used in any number of card routines. 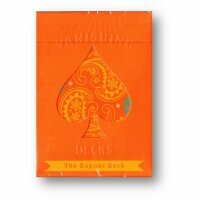 With this vivid orange deck, you receive a BONUS double-face card, double-backed card, ONE NORMAL BICYCLE JOKER and two different Ace of Spades cards. These cards have a vibrant orange color that bleeds all the way to the edges! This deck features a reversed back, where the official back design is colored white on a vivid orange. 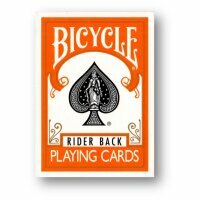 Impress your friends with the legendary smoothness of the air cushioned finish of the Bicycle playing cards and a very visually stimulating experience.